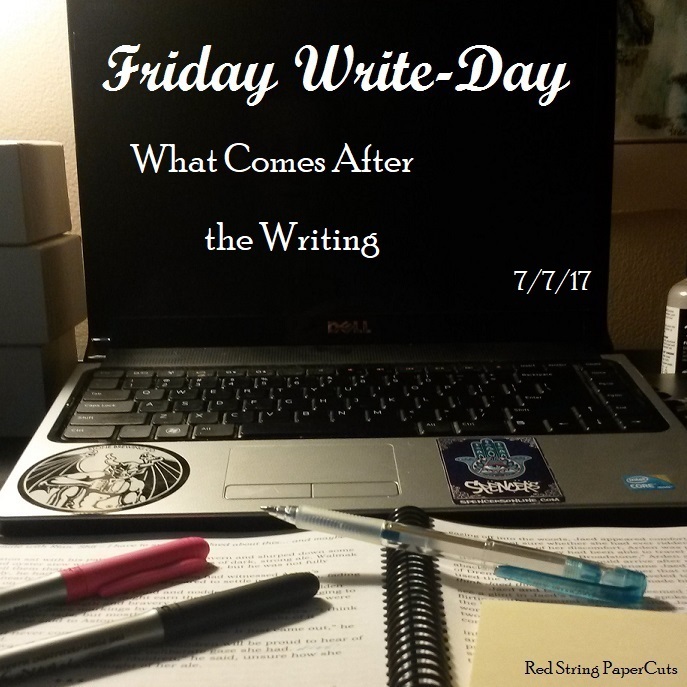 Friday Write-Day: What Comes After the Writing? Wow, has it already been two weeks? The last two weeks have felt hectic, likely because they sort of were. PW and I have been house-shopping. We thought we had found the one, but our inspector turned up some unforeseen issues, so we’re bringing in more experts to have a look. As you can imagine, this has occupied my time and mind-space for the last few weeks. But the writing continues, and moves forward! My word count for WoEM sits at 168k, which doesn’t sound like much. I have been proceeding slowly through the last 20k or so of my novel. Am I a little gun-shy of botching the ending again? Probably. But I think taking my time with these final few chapters will help me ensure that everything fits the way I want it to. It has also given me a chance to go back and review my opening chapters in preparation for sending them off to beta readers and my editor. Where does each character start, and how far have they come to this (near end-) point? Have the themes I set out to explore in the opening chapters been fulfilled or hammered out in later chapters? Do all of the little details, like ages and background, match up? Have I been consistent? There are probably endless questions I could ask. Despite the time it has taken away from writing, reading through the opening section of my book has reinforced what I’m doing — reminded me of what I’m trying to achieve. So What Comes After the Writing? As I am wont to do, I have been looking ahead a bit. Due to my editor’s schedule, I must finish Manuscript: Beta by the end of the month. I like having a hard deadline. But what comes next? Here’s how I am preparing to approach the end of my Manuscript: Beta phase. This will give me the chance to focus on other things, like the business aspects of our imprint that have been brushed to the side recently. I also like to separate myself mentally from the story for a time so I can come back to it with fresh eyes. Of course there’s a Manuscript: Charlie! This will be the polished (and hopefully largely intact) version that my editor sends back to me. I’m sure we will have some long discussions about the story as a whole, and I’m looking forward to delving into that with her. Book cover illustrations, book design, copyright process, potential publishing outlets, promotional efforts. All of that fun stuff. For the record, I’m considering using a POD service with one main ebook platform to start out. If I tried to sell on every ebook platform at once, it would just become too much to manage. I can always expand later. Those three tasks alone should take through until the end of September. If Manuscript: Charlie goes well with few substantive changes to the story at large, then I will prepare that draft for publication. If there is a Manuscript: Delta, it would likely just be a read-through and cleaned up version of Charlie. Hopefully. Writer friends! What am I missing? Obviously I haven’t covered every single detail, but is there a step in the process of which I am blissfully ignorant? Writing Goal for 7/14: 178,000 words and within striking distance of The End.